According to North Korean media reports, North Korean leader Kim Jong Un visited China with his wife from March 25-28. North and South Korean media outlets confirmed the meeting after South Korean intelligence reported that Kim had visited Beijing with his wife. Japan's Kyodo News agency had also previously reported that a "special" train from North Korea had crossed the Chinese border into the city of Dandong. ​Video footage of a heavily secured train thought to be carrying Kim widely circulated on social media Monday. According to KCNA, Kim remarked that the meeting with Chinese President Xi Jinping was his "solemn duty." The Xinhua News Agency confirmed that Xi held talks with Kim at the Great Hall of the People in Beijing and that Kim and his wife Ri Sol Ju joined the Chinese leader and his wife Peng Liyuan for a banquet. The pairs also reportedly watched an art performance. "China sticks to the goal of denuclearization of the peninsula, safeguarding peace and stability and solving problems through dialogue and consultation," Xi was reported as saying by local outlets. 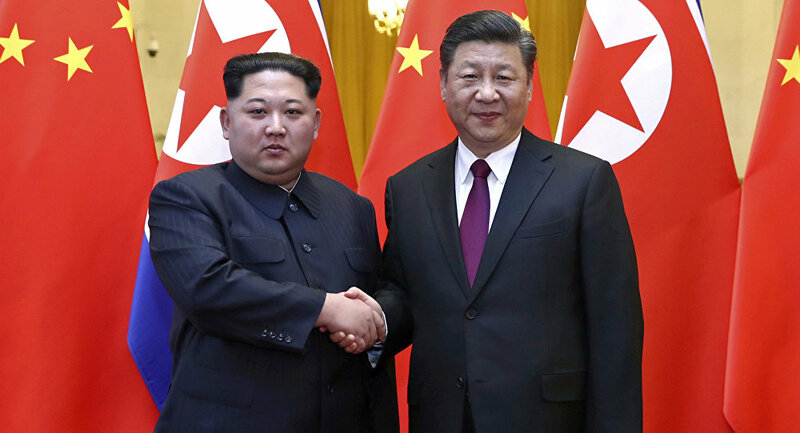 "This is a strategic choice and the only right choice both sides have made based on history and reality, the international and regional structure and the general situation of China-DPRK ties. This should not and will not change because of any single event at a particular time." ​​The visit to China was marked as Kim's first known journey outside the country since he became leader of the DPRK in 2011. The meeting comes ahead of a summit to be had between Kim and US President Donald Trump sometime later this year. The White House has since confirmed that the meeting did, in fact, take place and that the Chinese government had offered US officials a briefing on the trip.